Now the hoof needs fine tuning with a rasp. If you have never trimmed a goat's hooves, it may seem scary, but really it is a very simple and necessary procedure. 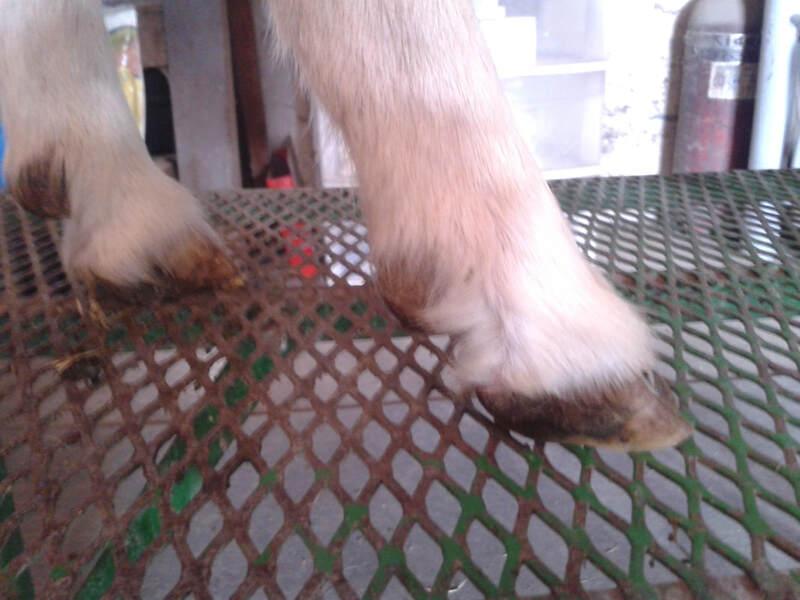 Keeping your goat's hooves neat and trimmed help keep the feet free from disorder and disease, and help keep your goat happy and comfortable. At my farm, we trim our goat's hooves every 4-6 weeks. We find that some goats need their hooves trimmed more often, depending on the individual goat. They generally grow faster if the doe is lactating or pregnant. The key is to check their hooves often, and make adjustments as necessary. Put your goat in the stanchion and feed them some grain to keep them calm and occupied. Once the walls are flush with the soft part of the toes, take a look at the soft heel at the back of the hoof. This may also need trimmed in order to make the hoof level again. I generally leave the heel alone unless it is starting to fold over, like it is in the picture above. This part is always a little scary to me, but think of it as a cuticle or callus. As long as the flesh is still white when you trim, you are safe. If you start seeing pink flesh when you trim, STOP! Pink means you are getting close to blood. If you do draw blood, do not panic, and use some blood stop powder on the wound. 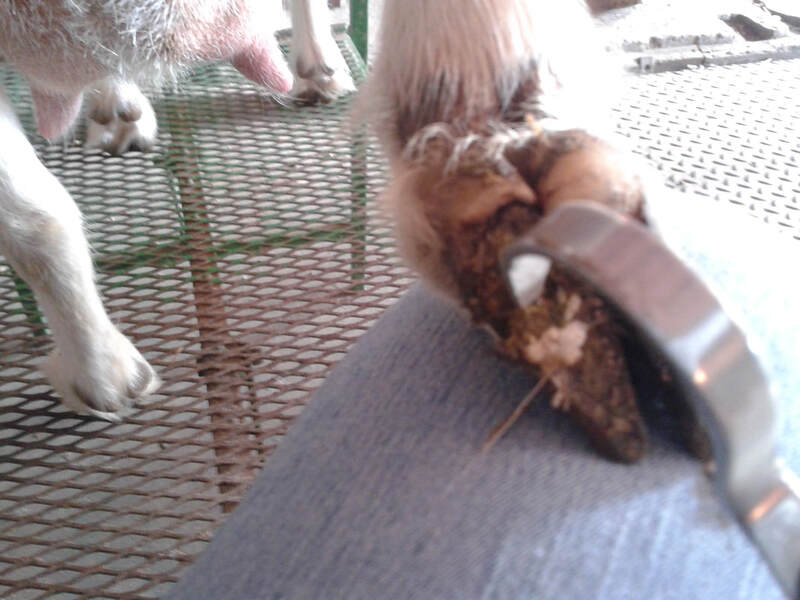 ​The final task in hoof trimming is to check the dewclaws. These may also need trimming, and are similar to trimming the heel. White is ok, and pink means STOP! During show season, we like to use a Dremel on the hooves and dewclaws. This is not necessary, but you may also use a fine rasp to put the final touches on the hoof, and fine tune the levelness of the hoof.